The history of citizen science continues to impress me. Everywhere I look citizen scientists played key roles in the discoveries and inventions we take for granted. In fact there are so many it may seem like I'm biased and give them too much credit. But looking closer, these really are eminent scientists with important insights who have not been recognized for the amateur scientists they once were. It is a bit sad that much of this history is overlooked. But a few writers have begun to notice and I've tried to profile these books whenever possible. So it's time to look at a famed citizen scientist who made important strides in electricity and chemistry, and development of the electric motor. It is Michael Faraday, as described in John Malone's "It Doesn't Take a Rocket Scientist: Great Amateurs of Science". Born in September 1791 to a poor family, Michael Faraday had very little opportunity for a proper education. He only made it through grade school and basic arithmetic before having to end his formal education. So he received no real training in algebra, geometry, chemistry, biology, or any other scientific discipline. With a curious mind he come to learn many of these, but he certainly came from outside the typical academic world. In those days if you were a young child and not going to school, then you went to work. So at age fourteen Faraday became an apprentice bookbinder to a local bookseller named George Riebau. Here he began learning the tricks of the trade and how to become a successful businessman. But nothing about science. At some point Faraday's intellectual curiosity got the best of him and he picked up a copy of Mrs. Marcet's Conversations in Chemistry. Mrs. Marcet was a writer of educational books, written for a lay audience, that were quite popular in the Victorian era. Amazing discoveries from the land of science and tales of new lands being explored around the world left the public hungry for accurate information about them. Mrs. Marcet filled this niche not with textbooks, but books for everyday people. Much like the popular science books and magazines avidly read by people today. As he was discovering chemistry from Mrs. Marcet in his teens, Faraday was also inspired by reading the Encyclopedia Britannica, particularly its entry on electricity. But with his usual modesty, he would later write, "Do not suppose that I was a very deep thinker, or was marked as a precocious person. I was a very lively, imaginative person, and could believe in the Arabian Nights as easily as in the Encyclopedia; but facts were important to me, and saved me. I could trust a fact, and always cross-examined an assertion." 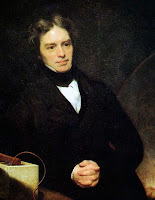 Young Faraday took another step toward enlightenment by attending a dozen lectures on natural philosophy (which is what science was then called) between February 1810 and September 1811. He had seen an advertisement for these lectures while walking along Fleet Street, the rowdy center of London journalism. They were held at a private house under the auspices of the recently formed City Philosophical Society. Each lecture cost a shilling...These lectures added to Faraday's growing store of knowledge, and brought him the acquaintance of several young men who would remain lifelong friends...Faraday also started taking lessons in drawing and perspective, so that he could better illustrate the notes he was assiduously taking at the Philosophical Society lectures. As Faraday approached the age of twenty-one in 1812, his apprenticeship as a bookbinder was drawing to a close. The Davy lectures had greatly inspired him, and he was determined to become a scientist. But with very little formal education and no money, he knew his prospects were dubious. He wrote to Sir Joseph Banks, the head of the Royal Society, begging for any kind of position in a scientific laboratory, but received no reply. He then recopied the notes he had taken at Davy's lectures, gave them a fine binding, and sent them directly to Davy, imploring him to give him a position at the Royal Institution, no matter how menial… On his return to London, Davy examined the bound notes from the young bookbinder and was impressed. Although he was now ensconced in the upper rungs of British society, he had come from a family that, while not nearly as poor as the Faradays, had suffered its own financial difficulties-after his father's death, his mother had taken in boarders to survive. Faraday had indicated in his letter that he not only wished to pursue a career in science, but also to help his widowed mother financially. Touched, as well as impressed by the notes themselves, Davy granted Faraday an interview in January 1813… In a bit of extraordinary luck, a position did open at the Royal Institution in February... He would be paid twenty-five shillings a week, and given two rooms at the top of the Royal Institution. Thus a self-taught amateur chemist entered upon a career that would eclipse that of Davy himself. It has often been said, in fact that Michael Faraday was sir Humphrey Davy's greatest discovery. It was now off to the races for Faraday. One of his first discoveries came in 1819, when he helped characterize a number of chlorine and carbon compounds such as hexachloroethane, which would later become a primary ingredient in fire extinguishers. A few years later he would follow-up by isolating the common organic compound benzene in 1825. Chemistry was Faraday's area of expertise but it was in electromagnetism that Faraday would see his greatest fame. He showed that the electricity in eels and in batteries were the same thing. He developed the still used terms of "electrode", "anode", "cathode", and "electrolysis". He devised Faraday's Three Laws of Electromagnetism and Two Laws of Induction. In 1821 he first demonstrated "a circular aspect to electromagnetism" through experiments that made a magnet move in the presence of an electric current. Through much tinkering this would become an actual dynamo generator and then a primitive electric motor. He also created the first electric transformer. Though it would take over 10 years to step through this process it would set in motion everything required for Edison and others to realize the electric revolution. Faraday resigned from the Royal Institution in 1861. He had already been provided with a house at Hampton Court by . Queen Victoria, where Sarah cared for him as he gradually sank into senility. He died at the age of seventy-five on August 25, 1867. If he was loathe to accept honors during his lifetime, they were heaped upon him in the course of the twentieth century. He is safely enshrined among the greatest scientists in history. The centenary of his discovery of the dynamo was the occasion of major celebrations in Great Britain in 1931. For the 150th anniversary of that event, his face temporarily replaced Shakespeare's on the ten-pound note. But the blacksmith's son lacking a formal education might have been most pleased by a salute from another great experimenter. Thomas Alva Edison, who also had no more than a grade school education, often said that Faraday's papers, books, and lectures were his greatest inspiration and taught him more than everything else put together, because the ideas were stated so clearly and cleanly that even an uneducated person like himself could readily understand them. Despite being just a poor schoolboy with a simple grade school education, this citizen scientist was elected to the Royal Academy in 1824. Here he continued his work FOR citizen science by the Friday Evening Discourses where experts would discuss the latest scientific discoveries with the public for a small fee, and the Christmas Lectures offered free of charge (and focused on children). So not only was he a citizen scientist we can all take inspiration from, he helped set the stage for many more generations of citizen scientists. A priest, a linguist, and a chemist walk into a bar. Some might mistakenly think this is the start of a bad joke. Instead it's just the life of citizen scientist Joseph Priestley. Most people learn about Priestley as the man who discovered both carbon dioxide and oxygen. They may also learn about his role as the first person to describe photosynthesis. But what they likely don't learn is that he was just an amateur scientist with no academic training in the sciences. It wasn't even his initial occupation (clergyman) or what he is most known for (philosophy). To help round out this fascinating man, Author John Malone gives a short yet insightful description of his citizen science background in his book "It Doesn't Take a Rocket Scientist: Great Amateurs of Science". Born on March 24, 1733, Priestley spent his early years raised as a Calvinist but quickly began searching for his religious bearings, ultimately becoming a priest in the Dissenter (and later Unitarian) church in his late teens. He spent this time preaching at local churches, writing well-regarded books on grammar, and teaching both languages and rhetoric. "Unitarians tended toward very liberal political views from the starts, so it was hardly surprising that Priestley would hit it off so well with Benjamin Franklin when the two met in London in 1776….The interest in electricity that Franklin aroused in Priestley was strikingly rewarded within a year, when the clergyman was able to demonstrate that graphite conducted electricity." How did this meeting happen? Well, by the 1770s Priestley had already been making quite a name for himself. As a "quintessential amateur" he had a curious mind that would latch onto a question, research it, and methodically experiment until he found his answer. This led to one of his earliest discoveries, the creation of sparkling water by infusing carbon dioxide into water, and earned him the prized Copley Medal in 1773. "It was quite common among the aristocracy to employ an artist, writer, or naturalist (as scientists were generally called) to serve as an intellectual companion. By this time Priestley was quite a catch, and he was able to command a very comfortable situation…It was over the next several years that Priestley did his most important scientific work." Having a patron meant not just a steady source of income, but also a steady source of time for devoting to one's personal interests. This let Priestley continue letting his mind wander. For example, at one point he had heard of some discoveries from the mysterious Americas that were all the rage in Europe. There was one tree in particular with a "a gummy substance secreted by a South American tree" that had very unusual properties. Many people were playing and experimenting with it. But Priestley was the first person to notice that not only was it stretchable and pliable, but it could also be rubbed on a piece of paper to make any writing on it disappear. He called this a "rubber" and the term, as well as his invention of the eraser, stuck. While having a patron probably ended his time as a "citizen scientist", many of his discoveries came before he had this support. He just kept up with the discoveries of the day and was an avid experimenter, often using items from around the house (such as laundry tubs or household jars) for his research. While he would later have friends like china-maker Josiah Wedgwood create custom laboratory equipment for him, he still discovered much as an amateur with materials from home. It should be noted one of the other reasons Priestley became so famous. Not only was he naturally curious and an astute scientist, but he also knew the value of quickly publishing his discoveries. Unlike some modern amateur scientists who may be intimidated by the committing themselves formally to paper, Priestley recognized it's value. In fact his early publication helped support his claim as the first to discover Oxygen, when two others (including Antoine Lavoisier) later tried to take credit for it. "Most great amateur scientists are known to us chiefly because of that scientific work. But Priestley was different.. His theological treatises had great impact, particularly in America, where the first Universalist church to carry that name was founded in Gloucester, Massachusetts, in 1799. Some treatments of Priestley's life are chiefly devoted to his theology and the liberal political beliefs associated with it. Others concentrate on his numerous scientific discoveries. Some religious historians claim that Priestley would have wanted to be remembered primarily as a theologian, but others are quite certain that his discovery of Oxygen was the high point of his life...He was certainly a very influential theologian, but he was also a major scientific figure. 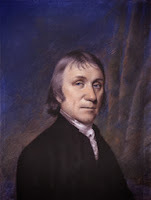 In fact, Joseph Priestley packed more accomplishments in to a lifetime than most of us can even dream about, to the extent that it is difficult to see him whole, so brightly do the individual parts shine."